Prints by Lory are from: Frederic Schoberl, Picturesque Tour from Geneva to Milan, by Way of the Simplon. London: R. Ackermann,1820. Photos are by David S. Miall. Citations from The Prelude are from the 13-book version of 1805, ed. Wordsworth, Abrams, Gill, NY: Norton. 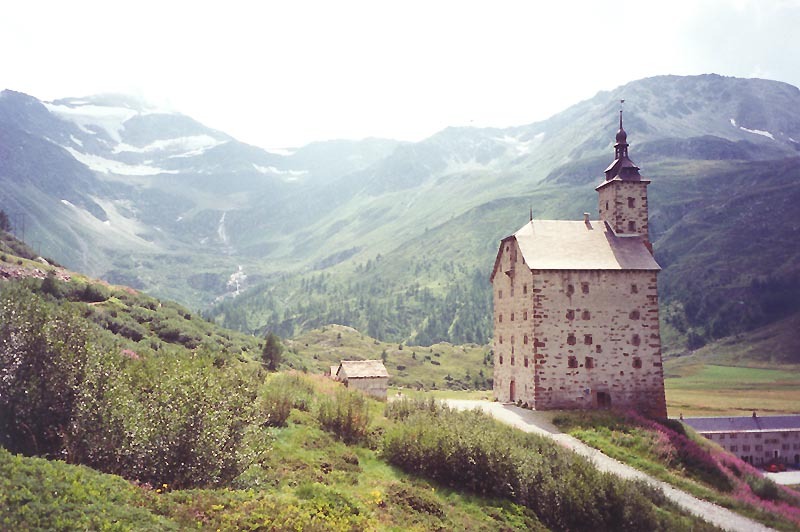 At Brig we quitted the Valais, and passed the Alps at Simplon, in order to visit part of Italy. 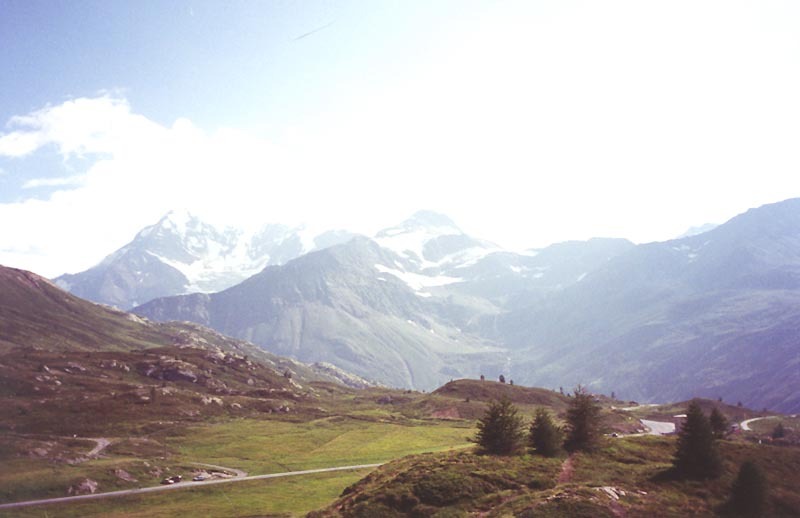 The impressions of three hours of our walk among the Alps will never be effaced. 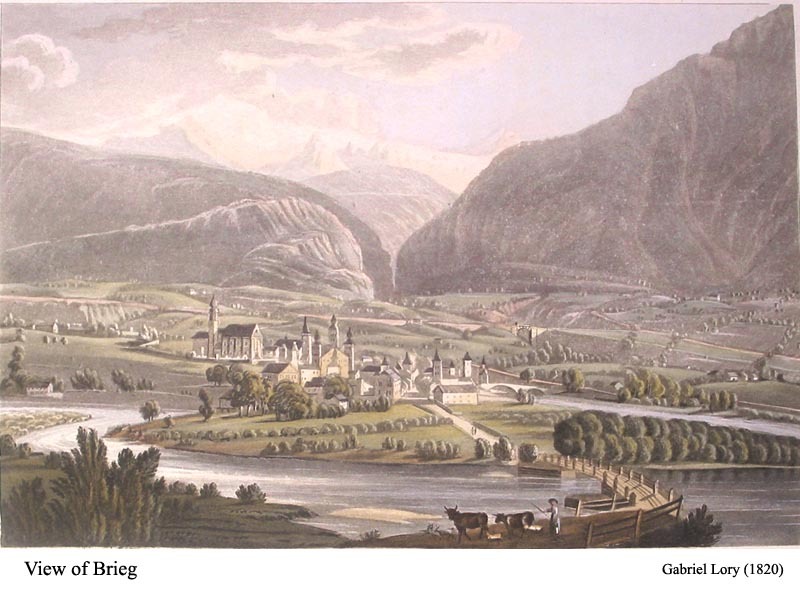 The works shown on the left in the print are the foundations for the new Hospice, initiated by Napoleon (whose new road over the Simplon is also shown). Wordsworth and Jones had lunch at the Old Spittal or Hospice (shown on the right) a couple of miles beyond the actual summit with a company of other travellers (free meals were provided to travellers here). Then they set off on their own down the pathway. 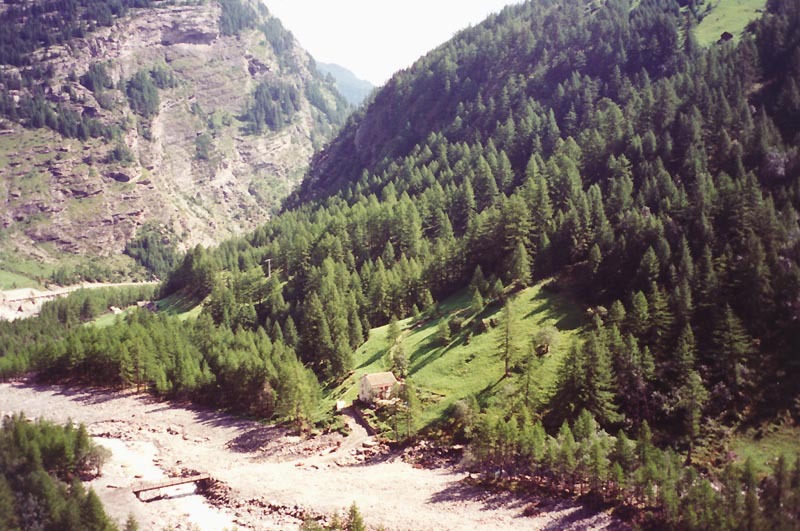 At the bottom of the valley, where they crossed the Laggina river, they climbed a path up a steep hill opposite, believing this to be their route: "The only track now visible was one / Upon the further side, right opposite, / And up a lofty mountain" (ll. 504-6). 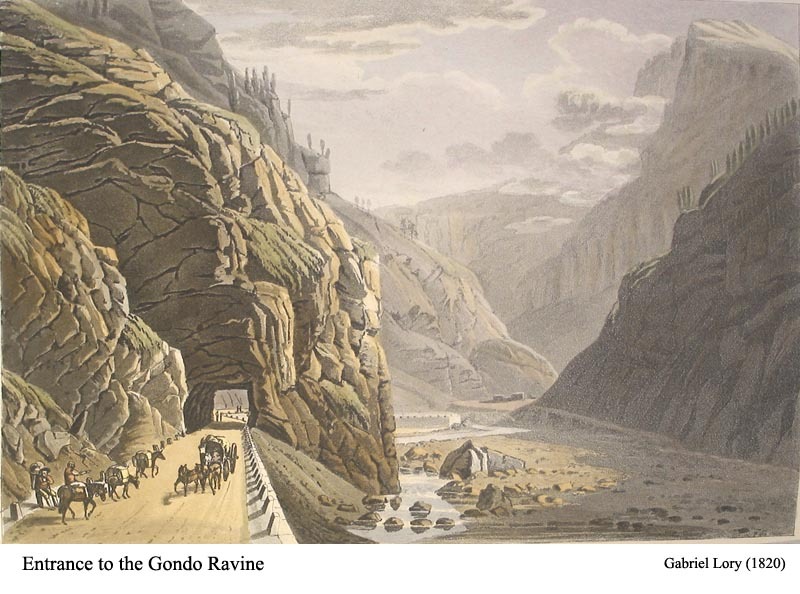 As a photograph shows, it is not evident that the correct path lies to the west, in the narrow opening of the Gondo Ravine (the modern roadway now marks this route clearly). The Laggina, showing the path up the Feerberg taken in error. The entrance to the ravine appears on the left beyond. The entrance to the ravine in 1820 (new road). The old path is still visible on the right bank of the valley. 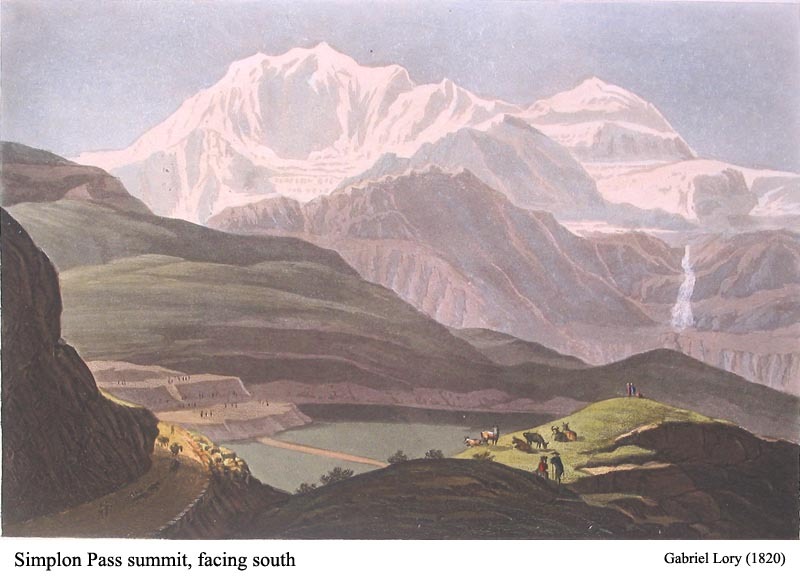 After learning of their mistake -- "we had crossed the Alps" (l. 524) -- Wordsworth and Jones would have returned to the edge of the Laggina, and walked into the Ravine on the right bank of the river. In The Prelude this mistake is made the occasion of an important passage on the imagination (525-548). The road through the Ravine was shortly to be built by Napoleon on the other side of the Ravine, and the old path was no longer maintained. (None of the contemporary views I have been able to locate shows the route as it was before the building of this road.) 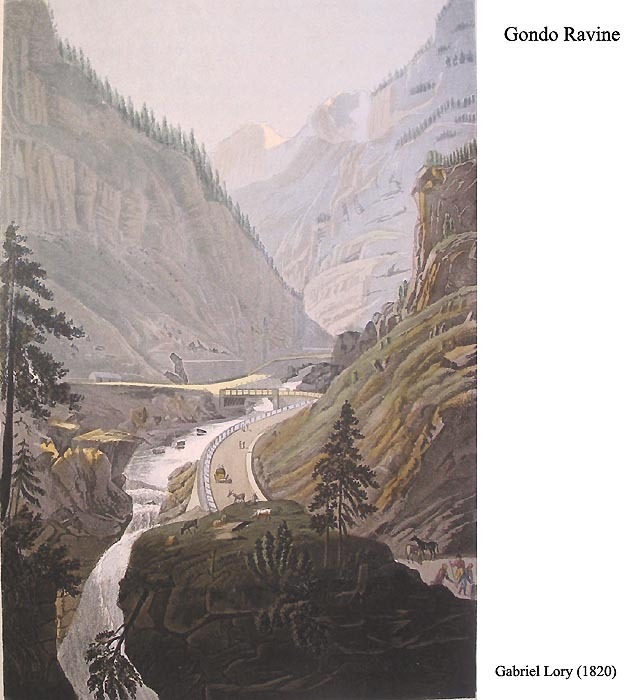 Wordsworth's "three hours walk" was undoubtedly that in the Gondo Ravine, given the evocative description he was later to provide in The Prelude. That night Wordsworth and Jones slept in the Spittal at Gondo village, "A dreary mansion, large beyond all need" (577). The next day they continued into Italy via the Val Divedro to Lago Maggiore.